I’m loving these, and I can’t wait to finish them up! And now, a gratuitous picture of a fat kitty stalking a laser pointer dot. Rowena loves that damn thing. She’s a loon. One of these days, I need to get video of her chasing it around the room. It’s quite funny. September 16th, 2008 | Tags: Beasts, Knitting, WIPs | Category: Misc. 12 comments to Gloves… and a Kitty! I don’t think I’ve ever seen that cat! HA! oh goodness, she’s gorgeous! kitties and their crazy stuff – got to love ’em. I love it… she’s all still and staring at the spot but her tail is just a blur. so cute! 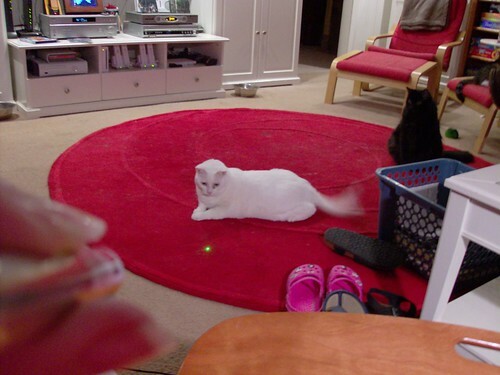 I’ve been tormenting my roommate’s kitties with a laser pointer too.. fun isn’t it? They are beautiful – but knitting 10 fingers scares me! Ooo!!! A green laser pointer!! you have a cat? (checks sidebar and sees you have 3) I don’t think we see your critters nearly as often as we should. Love the “tail in motion” shot of the cat 🙂 Glad you’re loving your gloves. They’re pretty! Your gloves are amazing! Unfortunately, where I live, there’s only about three days in the year where these would be neither too hot nor too cold… I wish you many perfect days to show these off in. You know, when I saw those gloves in the book I thought they’d be something I definitely wouldn’t make. Seeing them on you in fingerless form, I’m thinking they’d be perfect just like that for me. 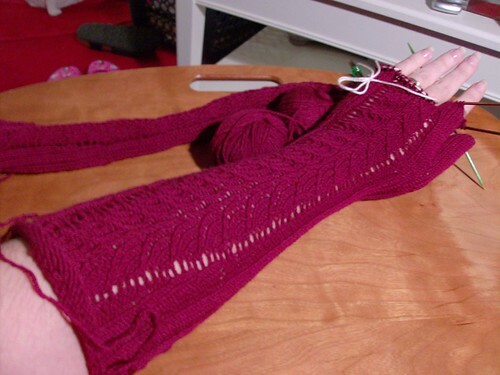 I fingers and wrists get so cold in some of the air conditioned offices here in the desert and I’ve been thinking about making some fingerless gloves. I really like the length of these though and the pattern is so pretty! Thanks for giving me a new look at them! And I love that color too. Must look for laser pointer for my cats now! Oh, these are swanky!! I might have to try to knit them for opening night! 🙂 Well, first I have to get my two hats done. Ugh!